So, you want to start a food blog?Â The food blogging community is vibrant and well-informed, full of people who love food just as much as you do – and you should absolutely join in! When I started blogging back in 2004 – ancient times in the blogging business – I had to explain to people what a blog was. It was a whole new world and people didn’t yet understand that a blog could be so much more than the digital version of the diary you kept under your bed as a child. As the years passed, instead of asking me what a blog was, people started to ask me how they could start their own blogs. I’ve given out lots of advice to individuals and I have even taught classes at local cooking schools that cover how to build your own food blog from the ground up. The process is much simpler than it used to be because there are so many more options, but those first few steps to getting your site launched are crucial – but they’re easy and you can get started in less time than it takes to bake a pie! Food blog names are often just as colorful as the photography on the blogs themselves. You’ve probably even thought of a few names that you’d like to use as you were reading your favorite sites! 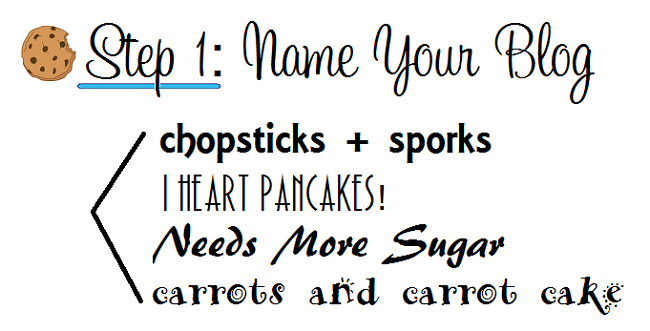 Use your own name, come up with a catchy phrase or combine two (or three) of your favorite foods into a title. Do a quick search to make sure no one is using it, and you’re ready to move on to step two! There are so many topics in food to write about. You can write about food politics, what you ate for breakfast or chronicle your journey towards becoming a professional cake decorator. Any topic is fair game – pick something you love! Second, pick a host and sign up. Once you have picked out a name, you need to buy your URL and sign up for hosting. A web host is going to provide storage and access for your food blog, and it is important to have one that is reliable and easy to use, especially if you don’t have a lot of prior web experience. After all, you want to focus on the content and not the coding! Â I recommend starting out with BlueHostÂ (this is an affiliate link, see below for disclosures*). Their hosting packages are affordable, and they offer different packages to suit your needs as your blog grows. They make it incredibly easy to install WordPress with one click installation and offer lots of top-notch 24/7 support. Plus, your domain name is absolutelyÂ free when you sign up with them! Other big advantages of BlueHost include free e-mail addresses on your domain – i.e. you@yourfoodblog.com – that make it easy for new readers to contact you, as well as giving your site a very professional feel from the outset. E-mail address setup is a service that many hosts charge a monthly fee for, and getting it for free is a very nice bonus! Once you have WordPress installed, you are only minutes away from putting up your first blog post. Now, you need to set up your theme, which is the face of your site. When you use BlueHost, you’re automatically connected to the MojoMarketplace, which is one of the biggest premium WordPress theme repositories out there. You’ll have to pay a premium for those themes – hence the name – but premium themes come with lots of features that allow you to customize the look and feel of your site. That being said, there are also plenty of fantastic free WordPress themes that you can view just by browsing the Appearance tab of your new WordPress site. With WordPress, you can change your theme with the click of a button, so you can upgrade or alter your theme at any time if you feel that your site could use a facelift. 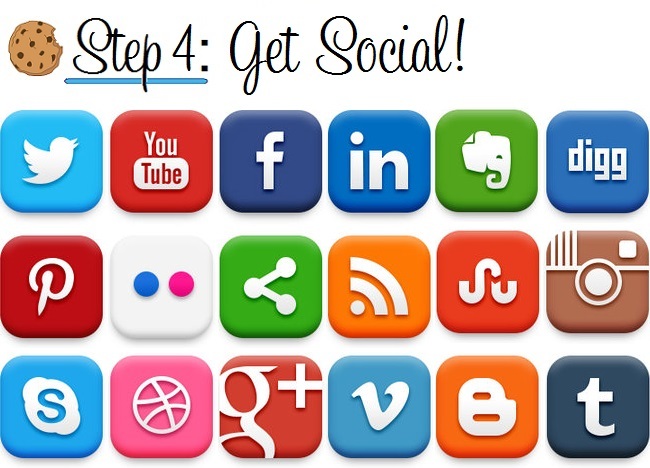 Fourth, set up social media! Food blogging is about food and it is about community, so you need to get connected in order to interact with other bloggers and attract new readers to your blog! Start a Facebook page for your blog, open a Twitter account and start a Pinterest Page, all using the name of your brand new blog. I also enjoy using Instagram for sharing pictures while I’m on the go, but there are no shortage of social networks to join, and you might find that Snapchat or Periscope to be a new favorite! Social networks allow you to connect with your readers – both new and existing – on a more informal level than a blog post, allowing you not only to share your content, but to give advice (such as cooking tips) and take suggestions for new content! It is fun getting your blog up and running, but the content is still the most important part of having a food blog. Don’t forget to blog about what you love – not just what other people are blogging about – because when you are passionate about a subject, your writing will be more engaging and you will be able to build up a like-minded readership to share in your culinary adventures! 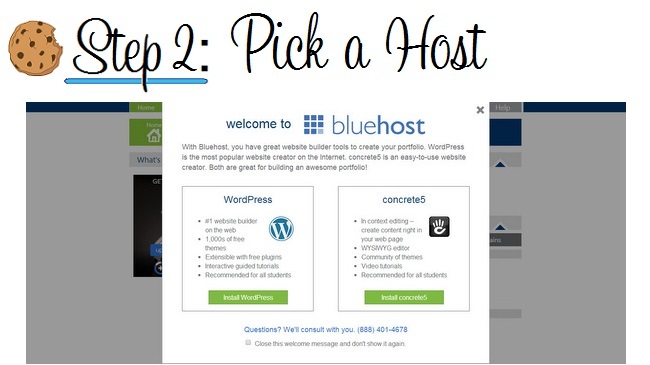 *Disclosure: The links provided in this post to Bluehost are affiliate links and I will receive compensation from Bluehost for any referrals made to them through that link. The opinions discussed here are my own and are freely given. While I absolutely appreciate anyone that gives them a try through these links, no matter what hosting company you choose to work with, I encourage everyone to get out there and consider starting a food blog – if for no other reason than to have fun and connect with fellow food-lovers! I am almost ready to start a blog but have one question. If I choose a WordPress theme, can I change the colors or fonts or must I stick with what is previewed? Thanks for your help. I love your blog, by the way. Marjorie – That is a great question. You will be able to change the colors and fonts to suit your tastes and get the look that you are going for! Your suggestions are very helpful! But, do I need the design editing and photography capability to be a great food blogger? Because people love nice pictures and cute blogs, like yours, I find it hard to join in the food photography lover without those things. Thank you for making such a great blog! Helen – Thanks for the kind words! You don’t need to be an expert at design and photography when you start out. Those are skills that you can develop as you go! When it comes to the design of the site, there are lots of great templates out there and Bluehost, for instance, has a dedicated team that can help walk you through picking out and customizing a template – no design experience needed. As for photography, that is a skill that you can develop over time. 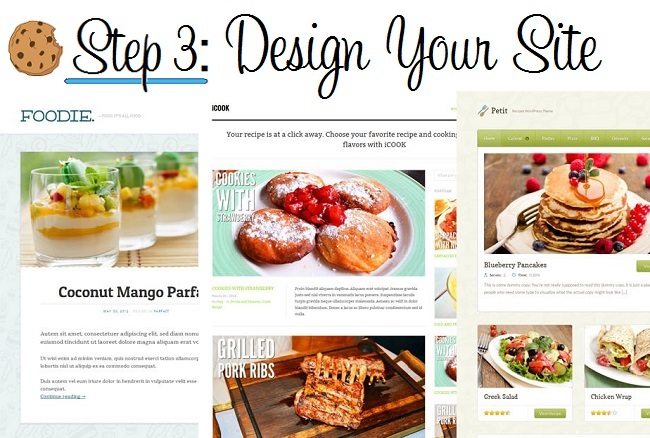 Food bloggers are a supportive group and you can ask for advice to improve as you go. A love of food comes first, photography second! why is regular ’email’ not included in the social networking options? Hi Clarice, That’s a good question! E-mail isn’t considered a social network, though it is a communication tool. Social media sites generally allow you to connect with a wider audience, including people that you may not already be “friends” with (such as people who can follow your feed or “like” your page). While you can e-mail a group of people at once, it is considered to be a slower and less-social way of communicating because the audience is much more limited. E-mail is a great tool, but social media offers a greater chance to connect with both new and existing readers. Please give me your recipe for Los Baez salsa.Pretty please.Also how do they make the taste consistent throughout the year when tomatoes aren’t fresh?And do your tortillas taste like theirs?Thank you. Please give me your recipe for Los Baez salsa.Pretty please.Also how do they make the taste consistent throughout the year when tomatoes arenâ€™t fresh?And do your tortillas taste like theirs?Thank you.